In the summer of 1989 Leeds United showed their intentions to end a barren spell in the wilderness of English footballs second tier, a Division they had been in since relegation from the top flight in May 1982. Having secured the services of Gordon Strachan and Chris Fairclough towards the end of the previous season, Howard Wilkinson was backed in the transfer market like no other Leeds United manager had ever been backed before. The media circus centred around the arrivals of England international defender Mel Sterland from Glasgow Rangers, the much sought after John Hendrie from Newcastle United and the much maligned, controversial figure of Vinnie Jones from Wimbledon. “I broke my leg in a Merseyside derby at Goodison Park and I was not expected to recover. However, I was focused and determined to work my way back to fitness. Eventually I returned, playing in the reserves at Anfield but I seemed to suffer one injury after another, including a cartilage tear that ultimately finished my career. “My time at Liverpool, where I had won the much coveted league and cup double, was coming to an end and Kenny Dalglish was fantastic in negotiating a free transfer. I had many options, including offers from abroad, and after playing over in Ireland in a testimonial match, the Ipswich manager John Duncan spoke to me. “Ronnie Moran advised me that as I was trying to rebuild my career, a nice steady spell in the quiet county of Suffolk would suit me and although Middlesbrough also offered me an opportunity, I jumped at the chance to sign for Leeds United once I knew of Howard Wilkinson’s interest. “The ambition that Leeds was showing was incredible and Wilko sold it to me, I was desperate to prove people wrong, although I knew there was some hard work ahead. “Howard knew he was taking a risk with me and he arranged a session on Fullerton Park. We played a five-a-side in which I showed I was comfortable on the ball and I even chipped in with a few goals. Afterwards he held me back for a vigorous routine of running. I was absolutely knackered. My legs and lungs had gone. He told me to pop into the referee’s room, have a shower then report to his office to continue the negotiations. “Two or three days into pre-season I had a coming together with reserve striker Peter Maguire and my left knee went. I knew I needed to be up to speed so I tried to ignore it and carry on. “I drove home after training and my knee wasn’t right so when I returned to the club the following day I reported it. I was diagnosed with an injury that is common to marathon runners but as the season approached it soon settled down. Howard thought I would be fine and he named me in the squad for the opening day fixture at Newcastle. “Gary Williams was set to start the game at left back but he suffered a knock in training on the eve of the game so I was thrown in. I knew deep down that I wasn’t ready and it’s fair to say that I suffered a torrid afternoon. “Leeds is a big club with a big history and we were desperate to give the fans the promotion they craved. Everywhere we went the fans followed in their numbers and the atmosphere they created was phenomenal. “Mel Sterland gave us the lead and the game was heading for a draw after Gary McAllister had equalised but Gordon Strachan had other ideas when he fired a tremendous shot into the back of the net for a late winner. “Gordon was fantastic all season and without being disrespectful to Mick Hennigan, Gordon was almost like Wilko’s assistant. “I remember a game at the start of April against Bradford City at home. We played them off the park and led 1-0 but we should’ve put the game to bed. Late on they got a free kick which was taken from the wrong position and when the ball was hammered up field, they eventually won a penalty from which they got an undeserved equaliser. “Strachan was raging. He got in the dressing room and was shouting and screaming about the referee not ensuring that the free-kick had been taken from the right place. He then started to lay into the back four and I wasn’t having it. I felt he was mouthing off for the sake of it and I jumped up and told him so. We had to be separated; I completely lost it with him. “These incidents happen in dressing rooms all of the time and the following day we both apologised and the spat was instantly forgotten about. “However, the night before the game we were in a hotel in Poole, in Dorset, right by the docks and I was rooming with Chris Kamara. “We were comfortable all afternoon, it was a very solid performance and we got the job done. It was some journey back to Yorkshire. “John Helm interviewed me after the final whistle and told me that the afternoon had been a far cry from the opening day at St James Park and he was spot on. 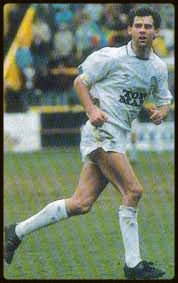 “I thought that the second half of the season was a springboard and I would kick on and enjoy my football back in the top flight with Leeds United. “Unfortunately, I suffered yet another knee injury whilst representing the Republic of Ireland in a warm up game as I looked to earn a place in the squad for Italia 90. “I couldn’t have joined a better club when I left Liverpool. I had my set-backs but I gave my all. I wanted to get 100% fit but never quite managed it. Thank you to Jim Beglin for giving me his time and the opportunity to write this article.